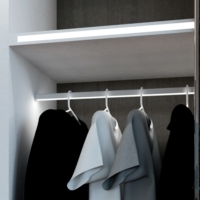 The Nova USB re-chargeable wardrobe sensor light from Sycamore Lighting is powered by batteries, and suitable for use in bedrooms. It has an integrated sensor to detect when to switch it on and off, and a convenient charging port. 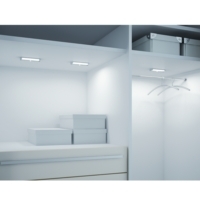 The light can be fixed using magnets to easily remove and refit it, and will work for 30 days based on an estimation of 10 minutes use per day. The light contains 16 LEDs and a 3.7V lithium battery. The Nova range is now available in 3 different sizes. How is the bracket fixed to the inside of the wardrobe. Hi - are these available in different lengths or colour temperatures, please? Thanks. Unfortunately this is the only available size and colour at the moment. 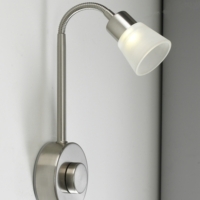 How long does this light stay illuminated once it lights up after detecting motion ?